With a destination as exotic and fascinating as the Galapagos Islands, the best tours are the ones that give you choices as to how you can take advantage of all that these islands have to offer. Spend a morning at the incomparable Espinosa Point, where you snorkel, see lava formations, go on a tropical safari, and maybe even see whales come to feed offshore! Hike along Urbina Bay for fantastic encounters with the giant tortoises, iguanas, and other exotic wildlife that make a home here! Walk along the lava-coated beaches of Sullivan's Bay or swim in the beautiful blue seas! Day 1 - Wednesday: Welcome to the Galapagos! PLEASE NOTE: All itineraries are approximate and subject to change based on availability and conditions at the destination. Departure from Quito or Guayaquil to Baltra Island (2½-hour flight). Arriving in the Galapagos, passengers are picked up at the airport by our naturist guides and taken in a ten-minute bus drive to the pier to board the M/Y Coral I or M/Y Coral II. Day 2 - Thursday: The wonders of Espinosa Point and a journey around Vicente Roca! Day 3 - Friday: Spend the day exploring Isabela! Day 4 - Saturday: Visit Egas Port and Salt Nimes and experience the wonders of Sullivan's Bay! Day 5 - Sunday: Farewell to the Galapagos! Baggage handling, transfers, and dinghy rides from Galapagos ports to the cruise vessel (So long as airfare is arranged by Palace Tours*). Any items not specifically described in the tour itinerary. Unless specifically mentioned, any flights, transfers to or from the airport, pre- or post-tour accommodations, or tour extensions are not included in the price of your journey, but can be arranged for an additional fee. All Ecuadorian citizens participating on this journey must pay an additional tax equivalent to 12% of their total tour price. *Please note that while airfare from Quito or Guayaquil to the Galapagos Islands is not included in the price of your journey listed above, all guests are required to arrange airfare, at an extra fee, through Palace Tours: $490 per adult and $350 per child under 12 (These rates are subject to change). This fee also includes transfers for both passengers and luggage to and from the ship at the beginning and end of the tour. Any passengers who do not arrange their airfare through Palace Tours will be charged a flat fee of $90 per person and will be responsible for their own transfers to and from the airport to the dock. Palace Tours is not responsible if passengers miss their cruise because of delays resulting from independent airfare or transfer arrangements. Scuba Diving during cruises: $ 326 half day tour with 1-2 immersions and equipment included. Wet suits rental: $ 25 for 3 or 4 night cruises, $ 50 x 7-10-11 nights, $ 75 x 14 night cruises. Kayak rental: $ 30 each use per person. Tips: Suggested per day per person $ 15 for crew / $ 10 for guide. 70% is due no later than 68 days prior to the tour's departure date. If a customer wishes to change their tour dates and their original departure date between 125 and 68 days away, then they will be charged a $200 fee per person. If a customer wishes to change their tour dates and their original departure date is less than 68 days away, then relevant cancellation fees will apply. i) More than 68 days prior to the date of departure: 15% as a cancellation fee of the total tour cost or the amount already paid, if the service is cancelled. ii) Less than 68 days from the date of departure: Palace Tours will not issue a refund if the service is cancelled and customers will still be required to pay 100% of their original total tour cost. All itineraries are approximate and subject to change based on availability and conditions at the destination. We strongly recommend purchasing travel insurance to cover the losses incurred in case of cancellation. For more information on travel insurance, please visit www.palacetours.com/insurance. M/V Galapagos Legend features 57 cabins: one balcony suite plus, eight balcony suites, four legend suites, 24 junior suites, 17 standard plus, and three standard suites. All cabins include twin beds or a double bed, a private bathroom, personalized air conditioning, a safety deposit box, an LCD-TV with multimedia system, and phone service for internal, local, and international calls. The balcony suite plus, 245 sq. ft. in size, features a large bathroom, bathrobes and other amenities, two private balconies, a mini fridge with champagne, exclusive decorations, and the capacity to become a triple via an extra bed. Interconnecting cabins get the 471 sq. ft. Galapagos balcony. Balcony suites, 226 sq. ft. in size, feature panoramic views, a private balcony, sliding doors, a mini fridge with champagne, and the capacity to become a triple via an extra bed. Legend suites, 215 sq. ft. in size, and junior suites, 161 sq. ft. in size, feature two panoramic windows per cabin and the capacity for four and 20 suites, respectively, to become triples via an extra bed. Standard plus suites, 118 sq. ft. in size, feature portholes and the capacity for four suites to become triples via an extra bed. Standard suites, 111 sq. ft. in size, are interior cabins. M/V Galapagos Legend also features a number of public areas for socialization, including numerous outdoor spaces, a pool, a stargazing terrace, multiple bars, a kid's corner, a sauna, jacuzzi, massage chairs, dining areas, and many more! M/V Galapagos Legend has a multilingual crew of 56 members and seven certified, naturalist guides. Naturalist guides speak English and Spanish, although guides who speak French, German, or Italian are available on request. Please indicate any preference at the time of booking. Cabins aboard M/V Galapagos Legend use 110 V and 120 V electricity. Guests whose devices do not use this type of current should supply their own adapters. · As per international law, you must have a visa in order to enter Ecuador to begin your trip. While Palace Tours does not provide visas, we can help by providing you with all the necessary information you need to successfully obtain a visa to Ecuador. · Palace Tours strongly recommends the purchase of adequate travel insurance in your country of origin prior to arrival to cover injury, illness, death, loss of luggage or effects, or cancellation. · Ecuador does not require a yellow fever vaccination, and the nation has no yellow fever or malaria alerts at any location at this time. · Palace Tours strongly recommends you consult your physician for any personal health advice based on your travel itinerary. Unless specifically mentioned, airfare (Domestic or international) to or from the Galapagos Islands and to or from Ecuador, accommodations before or after your tour, transfers to or from airports, and tour extensions are not included in the price of your journey, but can be arranged for an additional fee. All itineraries include two daily excursions to visitor sites in the islands. Transfers to and from the M/V Galapagos Legend to the islands will take place aboard dinghies; landings can be dry or wet and are indicated as such in the itinerary. · In the Galapagos Islands, the weather is relatively stable throughout the year. · The cool, dry season lasts from July to December and brings overcast conditions and choppier waters. Temperatures range from 19° to 25° C, with an average sea temperature of 21° C.
· The warm, wet season lasts from January to June and brings sunny skies and the occasional heavy rain shower. Temperatures range from 22° to 27° C, with an average sea temperature of 24° C (Though it has been known to dip lower). · The Galapagos Islands are a perfect destination to visit at any time of year! What should I pack with me on my trip to the Galapagos Islands? · In terms of clothing, we recommend comfortable walking shoes or boots with strong traction, "Teva" style sandals for hiking on beaches or wet landings, a bathing suit, a light-to-medium fleece jacket for cool or breezy evenings, shorts (Quick-dry, if possible), T-shirts, sunglasses (Preferably polarized), and a hat or cap. · We also recommend you pack your travel documents, such as your passport, a camera (With batteries and plenty of film/memory), a basic first-aid kit (Band-Aids, aspirin, seasickness pills, stomach-settling pills), and cash (Preferably in U.S. dollars). You should also pack a backpack for any off-board excursions so that you can carry any essentials you will need for the day. · This list is by no means exhaustive, but merely a suggestion to get you started. Ecuador's national currency is the U.S. dollar, so it is legal tender for any transactions you may make. What is the time difference in Ecuador? · The Galapagos Islands are on GMT-6 (The same as Chicago). They do not observe Daylight Savings' Time, so during the months of April-October, they are on GMT-7 (The same as Denver). They are one hour behind mainland Ecuador. How many airlines fly to the Galapagos Islands? How many airports are there? · Only two airports in the Galapagos Islands receive flights from mainland Ecuador: Baltra Airport on the island of Santa Cruz and San Cristobal Airport on the island of the same name. There is also a small airport on the island of Isabela in operation to receive the occasional small flight from Santa Cruz. · The Galapagos Islands are serviced by LAN, TAME, and Aerogal (Now owned by Avianca). Do I need to be in good physical condition to visit the Galapagos Islands? · Guests on M/V Galapagos Legend itineraries can expect several hours of gentle walking each day on paths which may be unpaved and at varying slopes, so guests should have a level of fitness appropriate to participate. Please ask any questions you may have related to fitness as an impediment to participation at the time of booking. · Certain treks or activities, like snorkeling, may require a greater degree of fitness. Can my children accompany me? Children under 12 years of age are allowed on board M/V Galapagos Legends excursions and pay 50% of the adult fare. Interconnected cabins are available for families with children and there are a number of offerings designed specifically for children, such as our on-board playroom. I have dietary restrictions. Can I be accommodated? Guests with dietary restrictions are required to provide advance notice so that we can make special arrangements. Please ask any questions or indicate any dietary restrictions you may have at the time of booking. 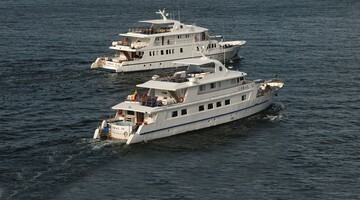 Is M/V Galapagos Legend available for group or charter expeditions? Yes. If interested, please inquire about group or charter details at the time of booking. Tips are not included in the total price of your journey. We recommend guests leave a per person, per day tip of $15 for crew/$10 for guide.